Weed seeds often undergo several changes in dormancy state between seed shed and germination (Figure 2.1) (Baskin & Baskin, 1985). These changes represent an adaptive response to the problem of immobility: a seed has little control over where it lands, but through dormancy response to environment, it can choose when to germinate. When first shed from the parent plant, seeds may lack dormancy and be ready to germinate if environmental conditions are favorable. This is commonly the case for those winter annuals like Galium aparine that commonly shed seeds in mid to late summer (Hâkansson, 1983). Seeds of these species need to be ready for immediate germination since winter annuals usually do best when they establish early in the autumn. Alternatively, seeds may have innate dormancy when shed (primary innate dormancy). Innate dormancy may be due to impermeable (hard) seed coats, chemical germination inhibitors in the seed coat or embryo, a cold or heat requirement, or other physiological mechanisms (Povilaitis, 1956; Baskin & Baskin, 1985; Taylorson, 1987). Such mechanisms are found in most weedy species of the temperate zone (Baskin & Baskin, 1988) and provide means for matching the period of germination to weather conditions that are suitable for establishment and growth of the plant. With time, seed coats break down, chemical inhibitors are leached away, and cold or heat requirements are satisfied by winter or summer temperatures, depending on the species. The seed then becomes capable ofgermination. Nondormant seeds still may not germinate, however, if environmental conditions are unfavorable. Frequently, seeds remain in a quiescent state until appropriate temperatures, water, light, and other germination cues indicate that conditions are favorable for germination and establishment. For some species, seeds that can not germinate because appropriate conditions are lacking may enter a secondary state of innate dormancy (e.g., Ambrosia artemi-siifolia - Baskin & Baskin, 1980; Arabidopsis thaliana - Baskin & Baskin, 1983). In that state, the seed must undergo another period of chilling, heating, leaching, etc., before germination is again possible. The transition into (and out of) innate dormancy is gradual: the seed passes through a series of conditional dormancy states in which the range of environmental conditions that trigger immediate germination becomes increasingly narrow (Baskin & Baskin, 1998a, pp. 50-64). Seeds of many species may cycle between innate dormancy and non- or conditional dormancy for several years before the environment happens to favor germination in an appropriate season. Due to these dormancy processes, most weed species germinate at particular times of year. For example, Chepil (1946) observed the timing of emergence of 59 species in Saskatchewan and grouped the species into five categories. The categories of peak emergence were (i) early spring (e.g., Bromus tectorum, Chenopodium album, Plantago major), (ii) mid spring (e.g., Setaria viridis, Cirsium arvense), (iii) summer (e.g., Amaranthus retroflexus, Capsella bursa-pastoris, Portulaca oleracea), (iv) autumn (e.g., Sophia multifida, Lepidium perfoliatum), and (v) no consistent period of peak emergence (e.g., Taraxacum officinale, Sinapis arvensis, Medicago lupulina). Other authors have found similar variation in the emergence times of temperate weeds (Figure 2.2) (Lawson, Waister & Stephens, 1974; Roberts & Neilson, 1980; Roberts & Potter, 1980; Hâkansson, 1983; Roberts, 1984), although some have also found species with bimodal germination in spring and fall (e.g., Veronica hederifolia in Figure 2.2). 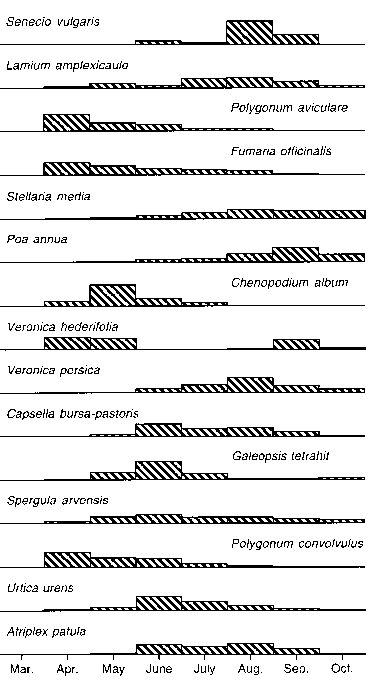 ure 2.2 Seasonality of emergence in 15 weed species (from Lawson, Waister & phens, 1974, experiment I). Data are percent of total counts observed three eks after soil disturbances performed at monthly intervals in the southern lited Kingdom. the time of germination may occur between species characteristic of early versus late spring (e.g., Figure 2.2). For some species, early and late spring are apparently very different seasons. Third, although most species have times of the year in which germination is most probable, at least some seeds germinate over a wide range of other seasons. This occurs because the dormancy mechanisms are less than perfect in matching germination to one particular season. However, that variability provides adaptation to environmental unpredictability. Finally, the species that have a very broad season of germination tend to be small-statured, rapidly maturing plants, with broad-amplitude temperature tolerance. Such species are well adapted to gardens and mixed high-intensity vegetable farms where the cropping conditions are unpredictable, and therefore, early catastrophic mortality is frequent. A large comparative study by Forcella et al. (1997) illustrates the importance of understanding how dormancy affects the seasonality of seedling emergence. By examining percentage emergence of several weed species in relation to environmental conditions at 22 site and year combinations, they identified soil temperature and moisture thresholds that induced secondary dormancy in Setaria faberi, S. viridis, Polygonum convolvulus, P. pennsylvanicum, and Amaranthus spp. (mostly A. retroflexus). Once the threshold for one of these species has been passed during a growing season, the seeds are induced into secondary dormancy. Few individuals are likely to emerge after that date, and a grower can modify management plans accordingly. Probably the principal utility of understanding periodicity of weed seed germination is that it allows disruption of weed life cycles. Two approaches are mentioned here and discussed in depth in Chapters 4,6, and 7. First, if the time of germination is known for the dominant weeds in the seed bank, crop planting dates can be adjusted so that either (i) the crop emerges before the weeds and thereby obtains a competitive advantage, or (ii) weeds are allowed to germinate and are then destroyed during seedbed preparation. Second, by rotating between crops with radically different planting dates, a grower can block the establishment and reproduction of particular groups of weeds in any given year. Thus, for example, in a fall-sown grain crop, spring germinating weeds will either remain dormant or, if they do germinate, suffer heavy competition from the already well-established crop. Those that do not germinate are subjected to another year of mortality risk as seeds, reducing weed pressure on later crops. Alternation of early spring grains or vegetables with late spring- or summer-planted soybean or vegetable crops may be equally effective in disrupting weed life cycles.